She only had one size, 5/2, dyed up. I bought two batches, Visionary, a colorway I’ve used before in rayon, and a new one called cayenne in rich reds and oranges. It’s always interesting to me how different fibers take the same dyes, and the cotton is quite a bit darker than the rayon. Still, I new I needed to add some blues & purples to my stock, so I started with the Visionary. I also knew I had to sett the cotton farther apart than I had previously to make the scarves softer and more pleasing to me. After all, I have to please myself before I please anyone else. So I decided on 15 ends per inch, and threaded the loom for Ms & Ws. 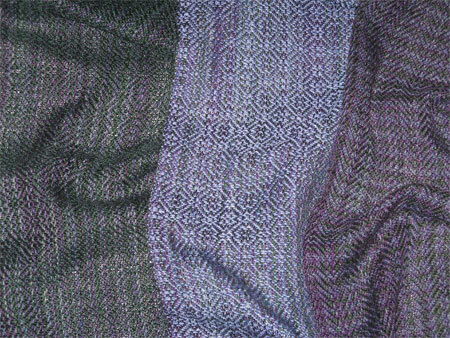 I wove the first (in the middle) using a solid periwinkle cotton weft. I particularly liked it. But for the second, I decided to go back to the ‘dark enhances colors’ theory. Since the Visionary yarn includes blue, purple, and green, I chose a solid dark forest green cotton for the weft (on the left), and again treadled it in the Ms & Ws pattern. It’s so dark, the distinction hardly shows up at all. Well poop on that! So for the third scarf, I used the Visionary yarn as weft, and treadled in a straight 1-2-3-4 twill. I like this one substantially better than the green. As for the sett, 15 ends per inch was okay, but I’ll make it even less dense next time around. Thanks, Jonathan. From your description, the scarf you saw was dyed using a batik method — indigo dye on white cotton. I can’t do anything woven that will approximate that kind of look. I think you can find what you’re looking for in import stores.